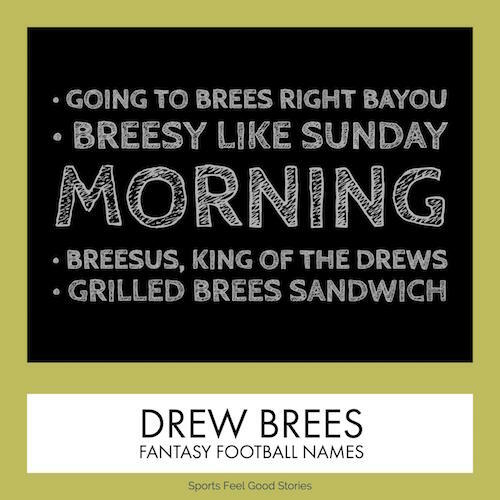 These Drew Brees Fantasy Football Team Names are winners, just like the player. Drew Brees, formerly of the San Diego Chargers, and Super Bowl winner with the New Orleans Saints is a fiery competitor. He’s also been a proven winner on the fantasy football front. Beyond Ray Lewis, is there anyone else in the league who has ever got his team as ramped up pre-game than Brees? Not bad, especially for a slightly undersized QB. You want to go to battle with this guy. And why not? All he does is throw touchdowns and win. Check out these names if you have Brees on your team. Breesus, King of the Drews. It Ain’t Easy being Breesy. Going to Brees right Bayou. Drew Brees has nearly 3 million followers on Twitter. Check out the official Drew Brees Twitter account. Check out all of the Saints fantasy names! Brees attended Purdue University and was one of the most decorated football players in Big Ten history. He still holds the Big 10 record for completions, yardage and touchdowns. He was the big man on campus. Brees has passed for over 5,000 yards in a season five different times. Think about that! No other QB has done it more than once. Brees’ dad played college basketball for Texas A&M and his mom was all state in three sports in high school.